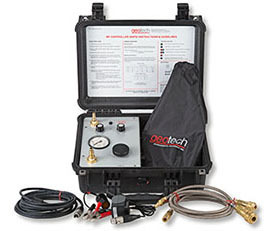 Together with the USGS, Geotech designed the first bladder pumps for groundwater quality and pollution monitoring. A bladder pump is a non-contact, positive displacement, pneumatically operated pump that uses compressed air. It consists of a housing that encloses a flexible bladder made of PTFE or polyethylene. A screen is attached below the bladder to filter out any material that may interfere with check valves. Bladder pumps are operated by air compressors, compressed air or compressed nitrogen tanks. Bladder pump advantages include ease of operation, portability, small diameter, and ability to pump large volumes of water relative to their size. A positive displacement submersible pump is recommended for environmental sampling at depths greater than 28 ft. and generally is recommended for use at wells. To use bladder pumps for groundwater sampling a controller is needed that allows control of the flow rate and pumping cycle at the surface. 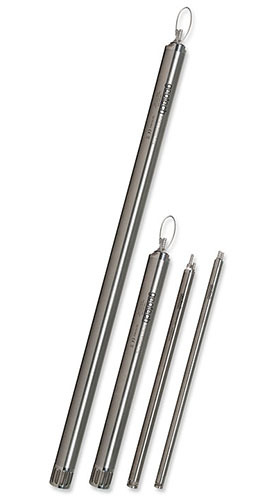 Stainless steel bladder pumps with PTFE bladders are recommended by the US EPA and USGS for most groundwater purging and sampling, especially as dedicated pumps in monitoring wells. Studies have shown that bladder pumps cause the least amount of alteration in sample integrity as compared to other sample retrieval methods. One of the benefits of Geotech Portable Bladder Pumps is their ease of disassembly for cleaning and decontamination. No tools are required, making them easier to move from well to well for purging and sampling. Constructed of #316 stainless steel and easy-to-replace PTFE (or LDPE) bladders. Sizes as small as 1.7cm (.675") in diameter are available. The Geotech PFAS-Free Portable Bladder Pump is designed specifically for sampling perfluroinated chemicals (PFAS's) such as perflourooctanoic acid (PFOA) and perfluorooctane sulfonate (PFOS) in groundwater. The Geotech Bladder Pump was designed with groundwater sampling as it's main purpose. They are constructed with easy-to-clean #316 stainless steel and trouble-free PTFE bladders to ensure durability and sample integrity. Both low flow rates for sampling and higher flow rates for purging are possible with the Geotech Bladder Pump. 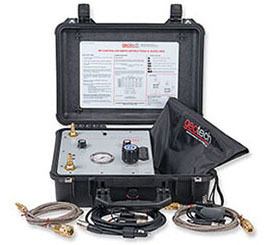 Microprocessor-controlled Geotech BP Controllers use accurate fill/discharge timers to sustain true low-flow sampling and will connect to any bladder pump system for expert control. They run off AC or DC current and are portable in their rugged field cases. For the ultimate in bladder pump portability, take a close look at the Geotech geocontrol PRO. It combines a mini-compressor inside the controller! 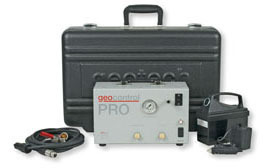 Leave the heavy compressors and air tanks behind because you can carry the Geocontrol PRO with one hand. Powered by 12 Volt DC, it can sample from depths to 55 meters (180') with low flow pumping rates.